BlackBerry Z3 ramping up for launches in India and Malaysia? BlackBerry has already launched the entry-level BlackBerry Z3 in Indonesia. Considering that the code name of the phone was the Jakarta, having the device touch down first in Indonesia was not a surprise. But where does BlackBerry go next with a device aimed squarely at Emerging Markets? Indonesia's neighbor, Malaysia, appears to be getting ready to welcome the device. 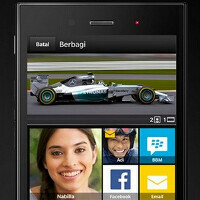 According to a report out of Malaysia, the BlackBerry Z3 has been added to the country's SIRIM database. The phone is listed under Brightstar Distribution, which is the company that distributes BlackBerry devices in the country. The BlackBerry Z3 also appears to be on the way to India. The safety guide for the phone has appeared on BlackBerry's web site in India, which could be a sign that the phone will launch next month in the country. The BlackBerry Z3 offers a 5 inch screen with a resolution of 540 x 960, which works out to a 220ppi pixel density. Powered by a dual-core 1.2GHz Snapdragon 400, the Z3 has 2GB of RAM on board with 8GB of native storage. A 64GB capacity microSD slot is available for those who need additional storage. Back and front facing cameras weigh in at 5MP and 1.1MP and a 2500mAh battery keeps the lights on. The BlackBerry Z3 is the first phone to roll off the Foxconn assembly line as part of a five year deal between the contract manufacturer and BlackBerry. Under terms of the deal, Foxconn designs, produces and stores the phones while BlackBerry adds its name and OS to the handsets. BlackBerry Z3 coming to India and Malaysia? If its priced right, then it can sell well. People forget that blackberry can run Android apps. Maybe not with just this device, but it's a good start. It does appear to me that BlackBerry is on the right track to be relevant again. Blackberry has to really price the phone good, if they want to compete the likes of Andriod, WP. Motorola is really nice phones, Nokia has also very cheap WP phones is place. Pricing won't be the only thing they need to do I'm afraid. I personally dont have the phone... live in europe so cant even buy it.. but people say (crackberry forum) they get more than a day in extreme use..
Well, for a phone that has better specs than a Galaxy Grand 1, it has to do well .. it's just the last 2 years made Blackberry lose it's name among costumers. Now it needs to build again .. The top half of the home screen looks just like Windows phone, a large tile, a medium sized tile and they even have the smaller tiles. No shame in copying. Dude that is not the home screen of the phone. That is a page where you want to suppose share a picture. The phone gives you suggestions and the bigger the picture it means the more you use that specific app/contact. And this was there before the new Windows Phone OS was released. So go figure who copied who. If you do really care about tech companies copying each other. Yes launch n promote it well in India, it will be in India.